Could Life Have Emerged on Earth's Near Twin? Yesterday, NASA’s Kepler team announced the discovery of the most Earth-like planet yet. It may be larger than Earth, but this exoplanet is situated firmly within its star’s habitable zone—and it’s been there for a while. So could it actually sustain life? Kepler 452b is located 1,400 light-years from our Sun. It weighs in at a hefty five Earth-masses and features a radius about 1.63-times larger than Earth’s. Technically speaking, that makes it a super-Earth, which is defined as an exoplanet with a mass between two- and ten-times that of Earth. This possibly rocky planet orbits its G2 host star—the same type as ours—every 384 days, which is the longest orbital period of any small, transiting exoplanet observed to date. (“Small,” in this context, refers to a planet with a diameter less than two Earth-radii). The astronomers aren’t completely sure it’s a terrestrial planet, however, assigning a confidence level between 49% to 62%. There’s a distinct possibility, therefore, that Kepler 542b is more like a mini-Neptune than another Earth, which would reduce its odds of harboring life—or life as we know it—to basically zero. Its host star is about 10% bigger than ours, and features an effective temperature of approximately 5,757 Kelvin (5,483 degrees Celsius). 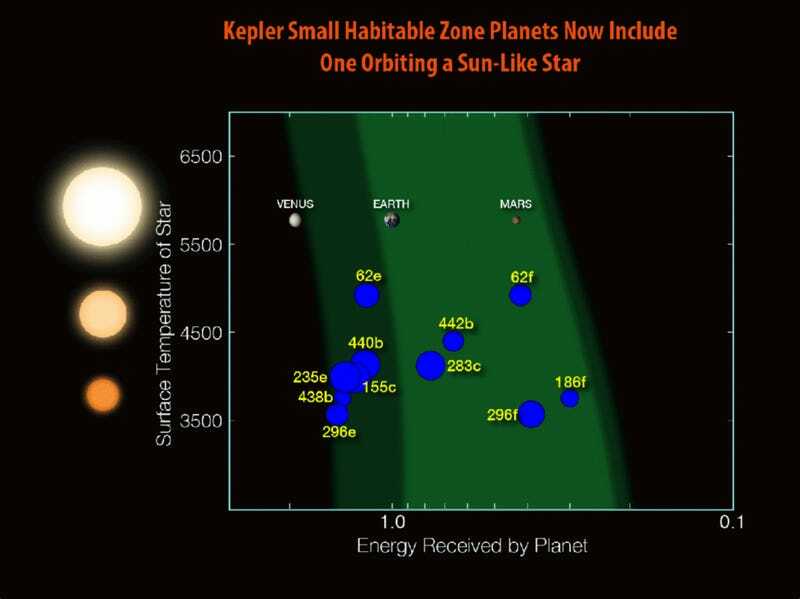 Kepler 542b is situated about 5% farther from its star than Earth, but receives about 10% more energy. It likely features a thicker atmosphere and cloud cover, and active volcanoes on its surface. Stellar evolution models place the age of the host star at 6-billion years, plus or minus a couple of billion. Probably not—but it’s not an impossibility. 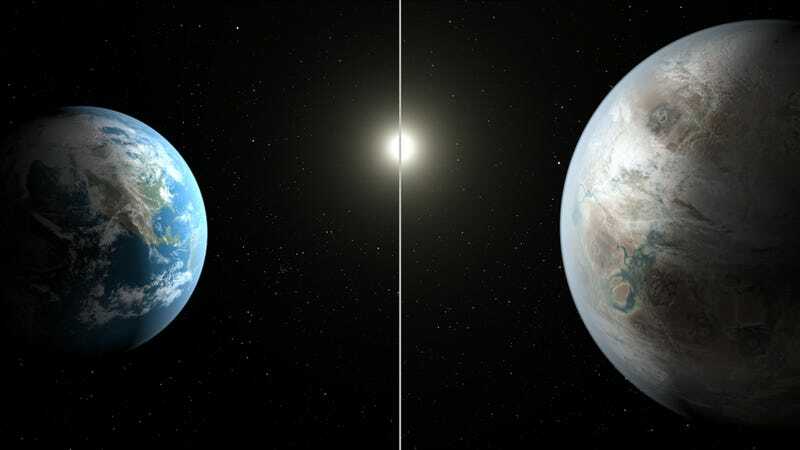 Breathless talk of Kepler 452b being “Earth 2.0” or “Earth’s twin” tends to overlook the differences between the two planets (the possibility that it is actually a small gas planet, for example). That said, it has a number of things going for it that are intriguing, from an astrobiological perspective. Kepler 542b is located approximately 1.046 AU from its host star (1 AU = average distance from Earth to the Sun). That places it well within the “optimistic” habitable zone of its star, which is comparable to where Venus was until fairly recently and where Mars was in ancient times (habitable zones are in flux as orbital periods shift and as the host star’s energy output fluctuates over time). That said, this planet is just slightly outside the “conservative” habitable zone, making it susceptible to a runaway greenhouse gas effect, or a maximum greenhouse. “Kepler 542b receives about 10% more radiation from its star than Earth,” noted Jon Jenkins, Kepler data analysis lead at NASA’s Ames Research Center in Moffett Field, California, at yesterday’s press conference. “Models of what might happen on this planet indicates that it could be on the verge of experiencing a runaway greenhouse gas effect like that on Venus.” Researchers have speculated that Venus may have possessed a global ocean early in its history, but that this ocean boiled away due to a runaway greenhouse effect. Needless to say, were the same thing to happen on Kepler 542b, it would not bode well for that planet’s ability to host life. Jenkins did add, however, that there’s no guarantee Kepler 542b has experienced, or will ever experience, a runaway greenhouse gas process. The size and mass of Kepler 542b may pose additional problems for life. At ~5 Earth masses, this planet may feature atmospheric temperatures at its surface that are too hot for biology to emerge; vast expanses of water (i.e. a possible “water world”, but that’s assuming it even has water); and lots of volcanic activity, both on land surfaces and in its oceans. According to astronomer Helmut Lammer, super-Earths are probably sterile. Unlike lighter planets, super-Earths cling to almost all of their hydrogen, resulting in planets that end up as mini-Neptunes. On a positive note, photosynthesis would work on Kepler 542b the same way it does here on Earth; both planets have comparable amounts of incoming solar energy. Another exciting observation: Kepler 542b is believed to have spent its entire existence in the habitable zone of its star, and will remain there for another 3-billion years. Given that it is believed to be older than our own planet, and assuming that it is, in fact, habitable, it is possible that life has had significantly more time to evolve there than it has here on Earth. Imagine if a civilization similar to our own had emerged on 452b, but with a two-billion-year head start. How might it have developed, advanced, evolved—or gone extinct? That said, it’s not immediately obvious how biochemistry and evolution would work on a planet hypothesized to experience a gravitational force twice that of Earth’s, and whether or not those sorts of gravitational conditions are conducive for the chemical processes required to spark life—even if the other habitability conditions are met. If life can emerge in 2g conditions, it’s reasonable to assume that it would look drastically different than it does on Earth. Should life be able to advance past the microbial stage, land vertebrates and plants would likely remain small, short, and stocky. Sea creatures could still get quite big. When it comes to habitability, however, bigness doesn’t imply badness. According to a 2014 paper by astrobiologists René Heller and John Armstrong, exoplanets with masses two- to three-times that of Earth could give rise to “superhabitability” — a perfect storm of life-friendly factors that could make an exoplanet even more habitable than our own. According to their research, oversized terrestrial planets have a number of things working for them, including long tectonic activity periods, enhanced magnetic shielding, large surface areas, smooth surfaces, optimal land-to-ocean-fraction and distribution, and thicker atmosphere. But as already noted, sometimes big can be too big. And in the case of Kepler 542b—at 5 Earth masses— it may be beyond the optimal scale posited by the Heller and Armstrong study. Given that it’s 1,400 light-years away, humans will likely never stop by for a visit. But if we could explore the surface of this planet, it’s interesting to wonder if we could survive. John Grunsfeld, associate administrator for NASA’s Science Mission Directorate in Washington, agrees, saying that in real-time we’d get stronger, but that it would be like a workout every day. As for the question of life on Kepler 542b, it’s still to early to tell. We’re not even sure if it’s rocky, let alone certain what its atmospheric and chemical composition is like. But now that we’ve pinpointed this intriguing, Earth-like orb, it’s fair to say that further study is seriously warranted. Contact the author at george@io9.com and @dvorsky. Top image: Earth and an artist’s impression of Kepler 542b. Credit: NASA/Ames/JPL-Caltech.